Sadly, we couldn’t all afford Gloria Vanderbilt or Guess jeans in the 80s. Even if we did boast a pair or two or three, we still needed some other jeans to fill out our casual-wear wardrobes. Enter the second-tier designer jeans. Like B-list (and C-list) actors, these jeans were probably just as good as the A-list varieties, they just didn’t manage to luck into the big time and didn’t command the big bucks. Just because they aren’t the Johnny Depp’s and Angelina Jolie’s of the eighties’ jeans world doesn’t mean these B-list blue jeans aren’t worth our love. You can snap some up on Ebay or scope out your local thrift store for your own pair of 1980s denims. A vintage pair of Sasson or Zena jeans topped with an Izod and a Member’s Only jacket would fer sure put you on the A-list at your next 80s party. 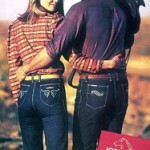 If the Jordache look was a little out of your price range, you didn’t have to worry. You could still get that dark denim designer look of the 80s on the cheap with Gitano. Anyone else remember this commercial featuring a stressed out stylist that still gives me anxiety to this day? 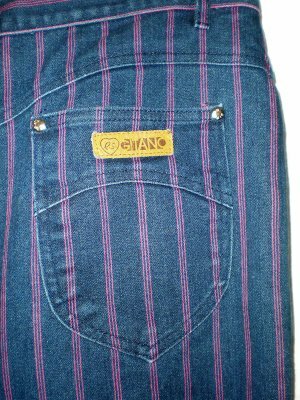 Along with being a little less expensive, Gitano jeans were also a little funkier; besides dark denim you could also get your Gitanos with colored pockets or pinstripes. 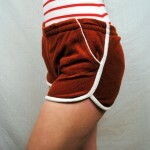 I had a pair similar to these, with light pink stripes . Gitano may have been the low hanging fruit on the designer jean tree, but they fit really great, and Mom couldn’t have been happier about the price. I didn’t own any Zenas, but I remember thinking they were incredibly exotic. My friend Monica’s mom, who had straight black hair down to her waist and drove a red Cougar, wore them, and I’m sure that added to their appeal. If Monica’s mom liked them, then CLEARLY they were glamorous. This commercial, on the other hand, is ridiculous. Swimming and then running on the beach in your dripping wet blue jeans?? Puh-leeze. 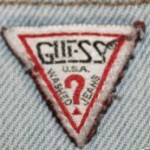 Some of these brands, notably Levi’s and Wrangler, survived and thrived. 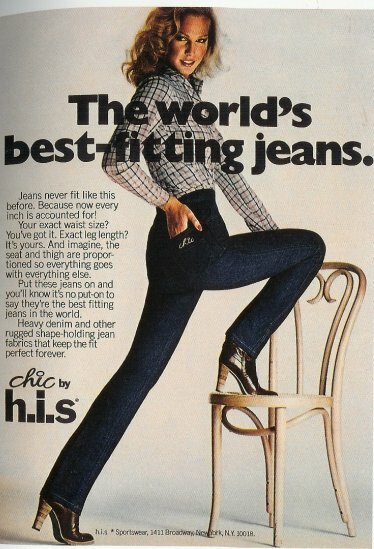 Most of these jeans makers, however, lost out in the 80s designer jeans battle. They never achieved the panache (and price tags) of Calvin Klein. I love all the 80’s jeans. They were true to size and fit my contour well. 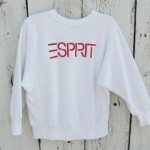 Im thinking of going vintage. Oh wow! Agreed! We’ll get them added! About the Bonjour ad: sorry to correct you, but that ‘s not a Delorean. It’s a Lotus Esprit. here’s a pic: http://smclassiccars.com/uploads/postfotos/1986-yellow-lotus-turbo-esprit-s3-not-running-1.JPG . Deloreans usually are without paint, because they have a stainless steel body.